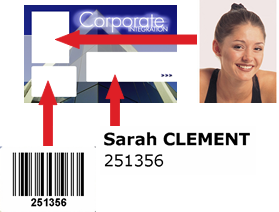 Evolis half panel ribbons for personalising pre-printed cards. With a focus on efficiency Evolis has released the Half Panel ribbon. 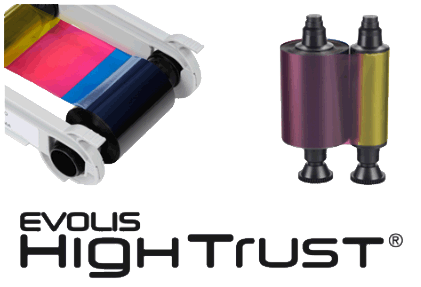 Reducing cost per print and reducing landfill. The Half-Panel YMCKO Colour Ribbon is a dye sublimation ribbon which has the same ink specifications as the Standard or Full Panel YMCKO Colour Ribbon used in plastic PVC ID card printing. The only difference between the Standard YMCKO Ribbon and the Half- Panel YMCKO Ribbon consists in the length of the Yellow, Magenta and Cyan panels which, for the Half-Panel, is half the length of the Standard Panel YMCKO Ribbon (see comparison below). Half Panel colour ribbon for ID card printing. Contact us to get further information regarding personalising per-printed cards. Ideally, send to us a sample of the card you are using and we will test print and send back to you the resulting print. The half panel ribbon is ideal for ID card designs that new only half a card printed in colour with an entire black panel to personalise anywhere on the card. 2: Add data to the printed card. 3: Completed ID membership card.